According to Wikipedia Smokey Bear (often called Smokey the Bear or Smokey) is a mascot of the United States Forest Service created to educate the public about the dangers of forest fires. An advertising campaign featuring Smokey was created in 1944 with the slogan, “Smokey Says – Care Will Prevent 9 out of 10 Forest Fires”. Smokey Bear’s later slogan, “Remember… Only YOU Can Prevent Forest Fires”, was created in 1947 by the Ad Council. In April 2001, the message was updated to “Only You Can Prevent Wildfires”. According to the Ad Council, Smokey Bear and his message are recognized by 95% of adults and 77% of children in the U.S. The fictional character Smokey Bear, created by the art critic Harold Rosenberg, is administered by three entities: the United States Forest Service, the National Association of State Foresters, and the Ad Council. Smokey Bear’s name and image are protected by U.S. federal law, the Smokey Bear Act of 1952 (16 U.S.C. 580 (p-2); 18 U.S.C. 711). 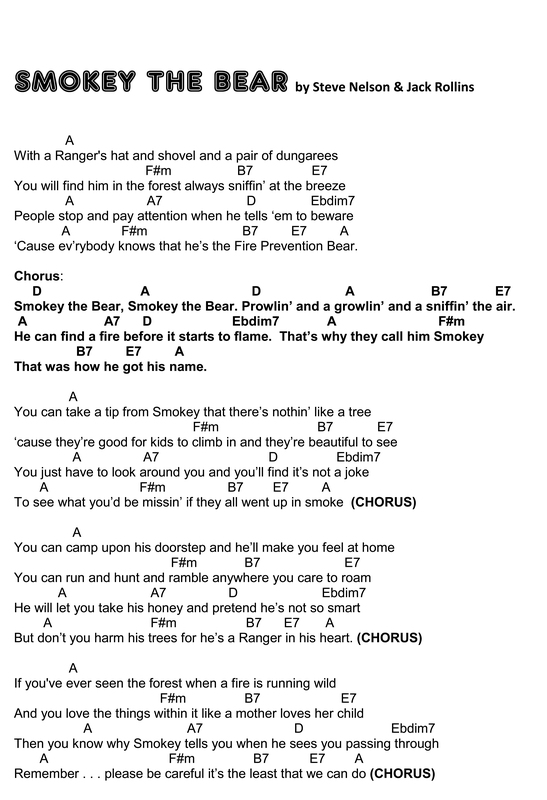 Growing up, Smokey The Bear was a big part of my childhood. I was an official Smokey The Bear Junior Forest Ranger and had a certificate and badge to prove it. I proudly wore that badge and sang the Smokey song. . . I had the record, Golden Book and a bunch of coloring books and comic books. 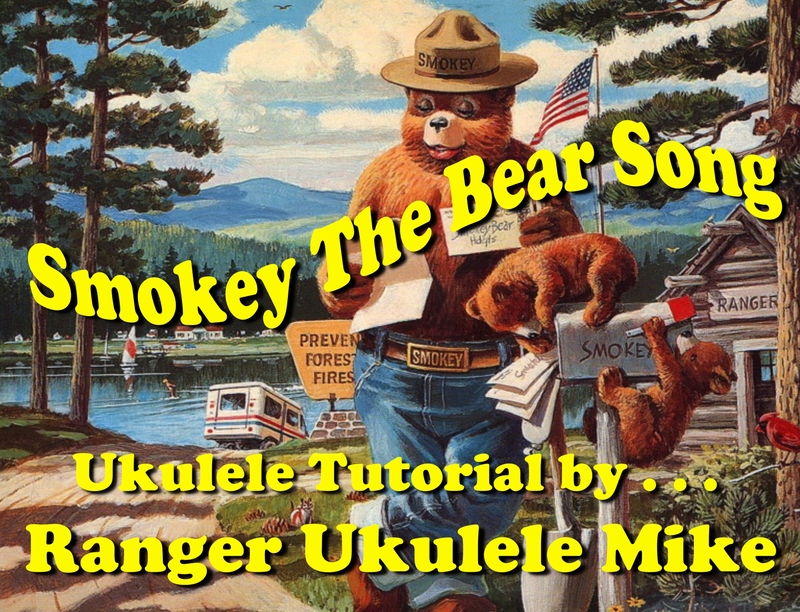 This is a fun song to do and great for campfires. But remember to follow Smokey’s rules about fires in the forest. Remember only YOU can prevent wildfires. . . which is the latest Smokey slogan. The song is in 4/4 time and I’m using a simple syncopated Down Up Down Up Down Up Down Up strum pattern. See the tutorial video for further explanation of chord fingerings.